sometimes you want to go "cage"
breaking from my normal bike-centric neanderthal routine, I'm having a temporary fascination with Road Whales. 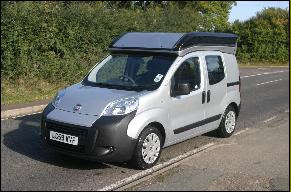 Little Euro road whales, cool and fun looking and extremely fuel efficient. I like these things. But they are "truck bait" in America with all the bloated over-sized hardware rolling the interstates. None of these are available in the U.S. 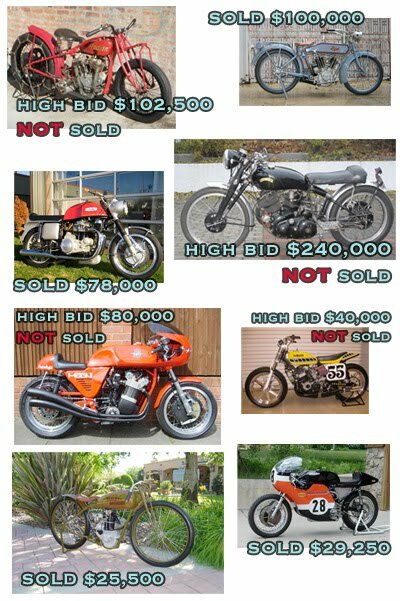 The results for the recent Mid America motorcycle auction in Las Vegas are interesting. Some people couldn't bear to part with their precious at any price. But someone snagged a late 70s XR750 for a cool $17K, and there was plenty of under-$8K semi-old iron that moved, so not all the reserve prices were up in the stratosphere. Seeing what DIDN'T meet reserve, that gorgeous Harley Peashooter that sold for $25.5K seems like a steal. All the old motorcycle-icious.blogspot.com links still work - they forward to this new domain motorcyclicio.us. Remember the movie That Thing You Do, how the band wanted to name themselves "The Oneders" (pronounced "ONE-ders"... Wonders). Except everyone mispronounced it as The "oh-NEE-ders." Yeah. It's sorta like that. My girlfriend likes to go to Kiehl's sometimes to get chick stuff - you know: lotions and crap. I don't mind her being a "slow-eee" shopper when we're there because they have antique motorcycles on display (which I always obsess over). They are a small part of the owner's collection. I noticed on the placard for an old Indian that it was owned by Steve McQueen. It also mentioned that it is never ridden, which I thought was sad. Steve McQueen was a rider. To him, the thought of putting a bike in a glass case would probably make him itchy - wanting to take a hammer to the glass and bust it free. Maybe even hacksaw off a fender or two... scab on a bash plate and sail it over some whoops in the Mojave desert. Oh yes. Old bikes are for riding. The awesome clowns at motorcycle cannonball -dot- com are doing just that, god bless their crazy little hearts. In September they will be riding pre-1916 motorcycles across the country. The "Wyman Cup" is named in honor of George Wyman and his cross country ride of 1903. That was the very first time anyone went coast to coast on a motor bike, and motor bikes at the time were more like mopeds of today. Mr. Wyman had to follow railroad tracks for much of his journey - there were no interstate highways, there weren't many major roads. First the Genius model, now the MY16 with bigger 16" wheels. The top of the line model has an 8-speed Shimano Nexus hub. I like the ability to pop on and off the subway with a small footprint and no fuss. Why are these not readily available in the U.S. ? This Deus tracker with a surfboard rack (???!!). I guess riding a badass tracker isn't enough cred. You gotta be headed for the beach to get in some surfing too. If that ain't enough, you can grow a full beard and smoke unfiltered Camels... start dating Supermodels. Whatever it takes. Yeah, I'd lose the surfboard rack. The rest is about as simple and perfect as you get. Spotted at Smith+Butler, a Brooklyn "biker chic" store for refined and dandy gentleman in Boerum Hill. Or is that Cobble Hill? I dunno. Somewhere above my pay grade is all I know. Check it out if you got the scratch. My sister sent me a video of a kid, not yet 2 years old, riding a motorcycle. 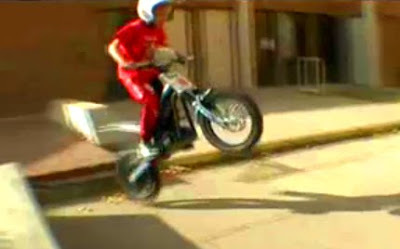 Youtube has a bunch of videos of kids on OSET trials bikes - they are electric powered and pretty damn awesome. The video above is of a highly skilled child, but if you go through the youtube archive you'll find some nutter children doing dangerous things. Some o' them parents need to invest in moto-x armor and full face helmets for their DangerFreak larvae. It seems to me that using 6061 aluminum plate is a genius design decision for the Comoto by Hirsch design. Being primarily a bolt-together affair it should translate well to scalability of manufacturing, allowing for economical low production runs. It looks mean too... if a bike don't look tough, what's the point? This one's got looks. 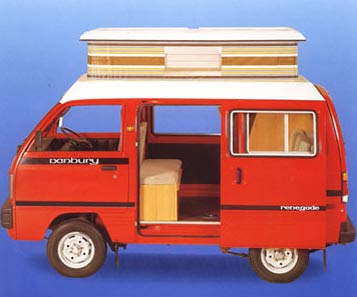 It's just ASKING for a badass paint job. I'm thinking Metalflake with a naked Aztec princess on an alter on the side panels. 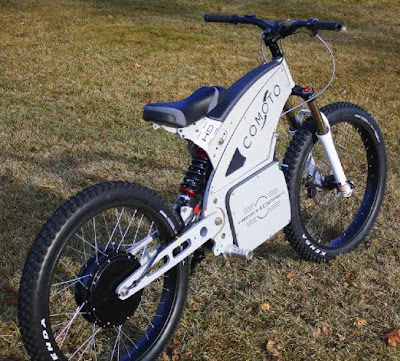 At 118 pounds total weight and a 40MPH+ top speed, it is essentially a fast bike with no cranks. Municipalities will have to get on track with defining new categories of rules governing the many different types of electric motorcycles and bicycle-hybrids. Are they bicycles? Are they motorcycles? Is the defining factor weight or speed? The "New Normal" points to a flood in the market of 3rd-gen cheap knockoffs of e-bikes and e-motos in a few years. At least that's what I'm hoping for: a two-wheel electrified bike renaissance not unlike the original "wheelman" bicycle phenomena of the 1880s. And for those who say that a no-crank bike is for the lazy and weak... you obviously have never jumped a full sized motorcycle up or down a curb or ridden a dirt bike down a flight of concrete steps. Moto-ing is hard work. 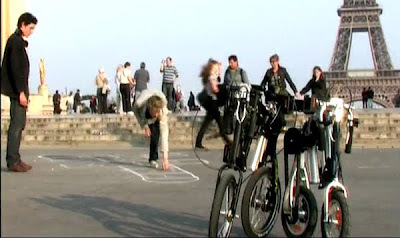 I'd like to try some of these under-200-pound machines on the streets (and sidewalks and concrete steps) of NYC. Yes. 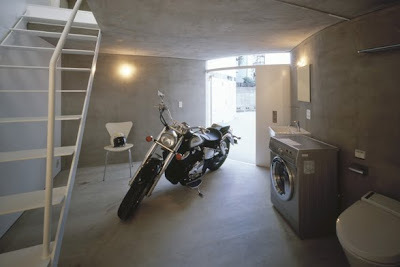 I do Love motorcycles and minimalism. bikes, bikes and more bikes... Motorcycles. My ongoing obsession with 2 wheeled motorized fun machines - an appreciation for fine and beautiful things. Some pictures here have been scabbed off the "interwebs". If you own the copyright to anything here and want it removed - I will gladly do so. Though I don't see why you'd want to do that, since we only display damned fine looking machines. "I started my career at the age of 5, driving cattle up the Abilene Trail. All the while fightin' off rustlers and Injuns." Sky City - Like the fabled Emerald City of Oz, one can live floating in the clouds - a prefect rapturous dream.